Co. Londonderry: Aghadowey (2), Agivey, Articlave, Baunbrook, Bovaght, Coleraine (3), Downhill, Drumcroon (2), Garvagh (2), Glenkeen, Letterloan, Ringsend, Slaght, Somerset. Co. Londonderry and Co. Antrim: Ballylagan, Knockantern (2), Port Stewart. Co. Antrim: Beardiville, Bushmills (2), Port Rush. The population falling within the Union at the 1831 census had been 50,940 with divisions ranging in size from Ringsend (population 1,039) to Coleraine itself (6,645). The new Coleraine Union workhouse was erected on a seven-acre site at the east of Mountsandel Road in Coleraine. Designed by the Poor Law Commissioners' architect George Wilkinson, the building was based on one of his standard plans to accommodate 700 inmates. Its construction cost £6,870 plus £1,270 for fittings etc. The workhouse was declared fit for the reception of paupers on 11th April 1842 and admitted its first inmates on 19th April. The workhouse site location and layout are shown on the 1937 OS map below. Coleraine entrance block from the south-west, 2003. During the famine in the mid-1840s, lofts were raised over the boys' dormitories to accommodate an additional 60 inmates. In 1847, a 40-bed fever hospital was erected at the south of the workhouse. The workhouse had its own burial ground at the north of the site. At the 1901 census, the population of the Union was 29,917 with 12 officials and 109 inmates in the workhouse. 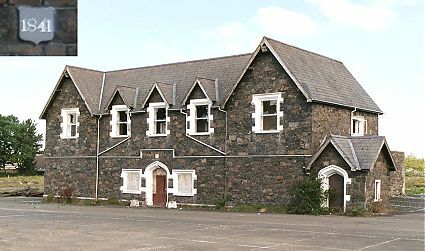 The workhouse site later became Coleraine Hospital and most of the workhouse buildings demolished. The entrance block survived, together with the fever hospital which was used as nurses' home. In 2003, the site was redeveloped for housing. Coleraine former workhouse site from the south-west, 2003. Public Record Office of Northern Ireland, 2 Titanic Boulevard, Titanic Quarter, Belfast BT3 9HQ. Holdings include: Guardians' minute books (1839-1948); Dispensary minute books (1852-99); Workhouse registers (1906-44); Combined workhouse register and statistical record (1944-9); Indoor relief lists (1943-8); Return of births (1906-44); Return of deaths (1900-48); In letters (1896-1907); Copy advertisements (1892-3); etc.